Russian style in clothes again gaining popularity. And imagine Russian beauty without luxury pavlovoposadskaja headscarf impossible. If you learn how to combine this item with casual clothes will be the height of fashion, and at the same time, will gain individuality. Woolen shawls are an indispensable accessory in the cold season. Autumn bright shawls look good with a leather jacket. Wear them as a neck scarf, so the scarf choose small size, it is better with tassels. Color match to the color of the jacket. If jacket classic black, the perfect bright red or Burgundy scarf. 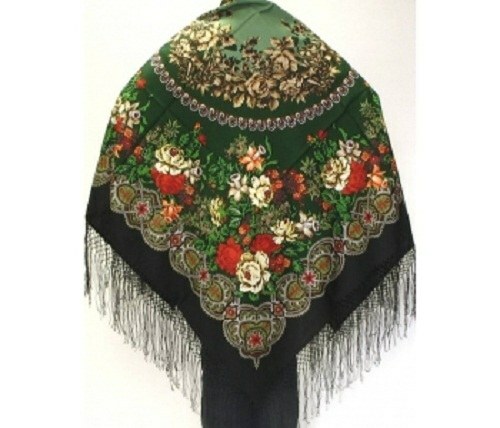 Brunettes can highlight its bright appearance green or blue coloring of the shawl. The brown jacket will fit a white handkerchief with a bold pattern. White jacket will noticeably enliven pale blue flowers on a white background. And don't be afraid that the bright shawl lost on the white background of the jacket. Too much emphasis, in contrast, will look a little messy. If you are looking for an accessory to a fur coat, stop for woolen shawls big size shawls. They are usually put on top coats. Shawls to better highlight shiny fur, at the same time, protecting it from friction, if you are in a public place. But to wear Pavlovo Posad scarf on head possible, if you want to create an expressive image. In this case, wear a short coat and boots with fashionable embroidery. You will then create a real Russian image and will look natural. In the summer of Russian shawls to wear as a poncho. For this shawl big size, folded on the diagonal, sew a bright button. Under a scarf, wear a turtleneck and jeans. And no longer need any additional accents. Popular denim jacket complete cervical accessories. Perfect with this jacket, looks white scarf with a delicate pattern. To tie it you can type "arafatki". Use scarves and sewing fashion accessories. Fabric can be cut even handbag, bag or blouse. But in any case, follow the principle of moderation. All attention should be only one bright accent, all other things should enhance the beauty of a scarf for his modesty.